What is wrong with being an immigrant of Maghreb origin in France? The statistics demonstrate an alarming situation: two-thirds of the children that fail school, 66 percent of the incarcerated population, and more than half of the workers unemployed in France are of North African origin[i]. These staggering figures shatter what is left of the French Republican myth. Integration has failed. Some accuse the "Arabs" of being reluctant to embrace the spirit of the French society, while others blame the government for not having implemented a long-term, sustainable, and coherent immigration public policy. Yet, both sides ignore the roots of the issue at stake: the cornerstone principles of the French Republic are incapable of coping with the social reality of modern France. It all started with the beautiful ideas of the 1789 French Revolution; Libery, equality, and solidarity were to define French citizenship. The Republic was meant to provide a universal framework for these ideals, transcending ethnicity, religion, and gender. Within the public space, one was not to be thought of as someone with dark skin, a Christian, a woman, or a teenager; one was supposed to be simply a French citizen. Religious symbols, specific cultural references, and foreign languages belonged to the private sphere. As long as the French people were mainly white and Christian, this model of unity proved to function fairly well. However, as migrants started to settle in France, the issues with this homogeneity began to grow larger. Yet, the political power decided to turn a blind eye to its profound inability to integrate the migrants and their descents into French society. Was it because France's citizenship expectations were too rigid? Anachronistic? Divorced from reality? Pfff, they scoffed. France was the country of freedom. And its ideals had always been fair, appropriate, and righteous by nature. Last autumn, the weather was incredibly mild for a November in Paris. It was Friday night, Parisians were listening to music, while drinking a glass of wine and laughing with the ones they loved. La vie était belle. They opened the windows to have a cigarette. All of a sudden, the terror struck Paris for the second time on November 13, 2015. [ii] Parisians heard cries and guns being fired and saw slaughtered bodies piling up higher and higher in the streets. Beginning at 9:30 pm, three suicide bombers struck the Stade de France. A couple of minutes later, mass shooters attacked three restaurants and two bars filled with young people near Republique. Simultaneously shooters were assaulting the Bataclan concert hall. 130 people died. 368 were injured. The killers were French, and the victims were French. The government declared a state of emergency, closed the borders, and claimed to be at war. Aggressive, warlike, and belligerent, the state used violence to counter violence, thus exhibiting a profound misunderstanding of the problem—because the problem is rooted in French society, not in the Middle East. How did France come to such a dilemma? “Everything had changed,” the newspapers proclaimed in the aftermath of the November attacks. Yes, everything had changed. But it changed long ago, in 1962, as the bloody war of Algeria was ending and over 800,000migrants came to settle in France. 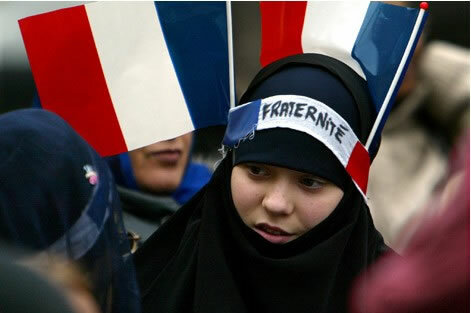 Today, immigrants account for 11.6 percent of the French population. The values established in 1789 by an homogeneous group of revolutionaries for an overwhelmingly uniform population, as universal as they were proclaimed to be, cannot succeed in providing the French people of 2016—which includes 10 million Muslims—with a unifying framework. The assumption that all cultures and customs can be molded into the secular ideals of French citizenship ultimately produces a hypocritical ideology which blames an Otherness for the failure of immigrants to assimilate rather than admits the inadequacy of immigrant-integration policies. It is, however, possible to keep the French cornerstone principles of Liberty, Equality and Fraternity without betraying their original meaning. But the French political power has to accept that these ideals must be revisited in order to embrace the changes in French society. In 2016, Liberty means that women should be able to wear any type of clothing, so long as it results from a free and deliberate choice. In 2016, Equality, means that all French citizens should have the same opportunities to climb the social ladder, regardless of their faith, name, or place of birth. And above all, in 2016, Fraternity means that French people must remain united and treat each other with respect. It is only by reframing these essential ideals with a more inclusive perspective that France could begin to reunite its people. When over 10 percent of the population of the country is Muslim, banning the burkini[iii] does not improve women’s liberty; instead, it curtails women’s freedom. When France defined la laïcité, the concept according to which religion does not have a place in public space, 95 percent of the French people were of the same faith, Christianity, which does not require any visual sign of religious belonging. Maintaining that France’s rigid notion of secularism does not discriminate against Muslims can therefore reveal an appalling inability to put oneself in another’s place or reflect a genuine racism. In either case, the problem is that of a profound lack of understanding for Otherness, stemming from an ignorance of difference. Ignorance promotes fear, and, hence, biased images of the Other pervade the collective perspective - witness presidential candidate of the far-right political party comparing Muslims praying in the French street to the occupation of France by Nazi Germany. To solve this issue, French people must discover each other because Otherness fails to disturb once it has become familiar. Otherness can even be a source of dialogue, respect, and mutual understanding. But for people to be able to get to know each other, they must first be able to meet, and, thus, those who are systematically marginalized must be integrated to the French society. It is the responsibility of France’s political institutions to take concrete moves in this direction. One year after the bloody terrorist attacks of November 2015, it is more urgent than ever for the French people and government to critically evaluate the present situation before the 2017 presidential election; otherwise that election might easily be won by a racist, anti-European, extreme-right political party. To prevent this outcome, France must acknowledge the gap between its alleged universal citizenship and the social reality that has produced the current poisonous atmosphere. In other words, integrating the 'Français issues de l'immigration', France's politically-correct term for those who do not match the stereotypical appearance of a French person, is the only solution. [i] INSEE Annual Report, 2015. [ii] The November attacks were the second wave of terrorism in Paris in 2015, the first one being the Charlie Hebdo massacre in January. [iii] Type of clothes covering legs and arms, used mostly by Muslim women at the beach.